HYIPsInfo.com is a listing of HYIP or AutoSurf programs. Your program will be added to the list automatically after payment is made. Do you still doubt if it is necessary to use our service? Look OUR PORTFOLIO! Listing Location Total Fees = Deposit in your project + Listing Fees` Add Your Program now! *50 will be reinvested into your program for the monitoring.$5 fee. If the minimum deposit of your program is higher than $50 you have to spend the minimum amount. **$40 will be reinvested into your program for the monitoring.$4 fee. If the minimum deposit of your program is higher than $40 you have to spend the minimum amount. ***$20 will be reinvested into your program for the monitoring.$2 fee. If the minimum deposit of your program is higher than $20 you have to spend the minimum amount. ****$10 will be reinvested into your program for the monitoring.$1 fee. 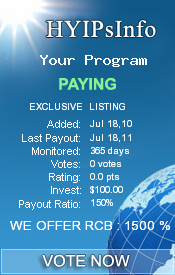 If the minimum deposit of your program is higher than $10 you have to spend the minimum amount. After your program is added, you will receive the html code of the monitor button or your can find it in the details page of your program by yourself.